SilverGlo Foundation walls in crawlspace. Installed cleanspace across 100% of the crawl space. Installed Sump and Dehumidifier in crawl space. Reinstall existing floor insulation in the garage. Replaced system in crawlspace and reconnected to existing ducts. HVAC tune up and home energy audit. Insulation for high energy bills. Just moved into house. Would like someone to check heating and air conditioning units for annual maintenance. Also to evaluate the crawl space. We have a humidity problem in our crawlspace and would like to have it fixed. Looking for an estimate to replace my duct work in the attic. The sales representative was professional, polite and interested in our needs, very knowledgeable, easy to talk with. Kelly and the installers did an excellent job. The house is much easier to cool andd the cost of heating and cooling was cut by half. There is not enough room on this page for me to tell you how much I think your company is worth. They stayed until the job was done - not leaving to go to another job. Thank you GSM for providing good old-fashion quality work, integrity, honesty and friendly service. "I admire the fact that your employees are obviously proud of your company's reputation and consistently go above and beyond to maintain the trust of your customers." "We have known about you folks for 55 years and we chose your company based on reputation and we needed someone that knows their business." GSM is the best! They are punctual, polite, respectful, kind, and will explain everything in detail. The tech was very knowledgeable, curtious and polite. The Long's have a talent for hiring and training people. All your staff treats people like family. Very friendly and pleasant to talk to - like making new friends. During the entire process we felt we were treated with honesty and integrity. The whole experience was quite satisfactory! The whole experience with everyone with GSM has been a pleasure. We chose GSM Services because of their reputation and past service experience. I'm really glad I found the right person to talk to about my cooling issues, and he did what he said he was going to do. We are truly more than satisfied with their work installing our new units. The process of changing our air/heating systems was done so efficiently from the beginning to the last result. "Zack was right on time, he was very polite and explained what he was doing as he progressed with the system check"
the advisor and technicians were excellent. A month after our install..... the proof is astounding. Joe & Susan K. E. Long Ave.
Not possible to improve your service. "I have been impressed with the service since changing to..."
"We are always pleased with GSM. Any issues we have are..."
"Zack and Tyler did a great job, courteous and explained..."
I appreciate the options I was given – options to either repair my old system or replace it, which I chose. GSM Services is here to help you improve the comfort of your home while lowering the costs of your heating and cooling bills. With many years of experience, you can trust us to perform the job right the first time. We offer a wide variety of home insulation services designed to improve every area of your home. We understand that using the proper insulation in the right areas of your home. We offer insulation in the attic, basement, crawl space, walls, floors, and even the garage! If you are interested in better insulating your home, contact us today for a FREE home insulation estimate. Just like your mechanic, HVAC contractors are of varying qualities and so is the quality of the work that they produce. Rather than deal with poorly done work trust your local HVAC contractors to provide the work you deserve. GSM Services has been in business since 1927, providing reliable air conditioning services in Gaston County, North Carolina. We offer a variety of AC services ranging from installation, repair, and maintenance of ductless, central air conditioning, and more. If your home's cooling system is not up to par, contact us today for a FREE air conditioning service consultation. We also service home heating services in Gastonia, NC as well. From gas to oil, and forced air to electric heat, we can do it all. Having a properly functioning furnace is one of you biggest priorities, so who better to trust to service your home's heating than the experts at GSM Services! We are here to help you identify what is needed in your home before you hire a contractor to install insulation. HVAC systems that don't work properly cause your home to be uncomfortable as well as loose energy from over working your unit. Knowing what is needed can help you avoid spending money where it is not needed and help you place that same money where it needs to go in improving your home’s comfort. GSM Services has the tools and the expertise to get your project done right the first time. Our friendly, knowledgeable staff want to use their expertise to help you find a solution that will work best for your home. Give us a call today for a free estimate! At this home we replaced a 15 year old AC unit that had quit working on the homeowners. We got them back up and running in a day! GSM Services sponsored one of our local elementry schools in the Are You Smarter Than a 5th Grader which helps to raise money for our local schools. We are honoroed to participate each year. Complete system installed for customers home comfort. Mrs. Laws noticed that her system was not running as efficient and consistent as it should. She gave GSM a call as we were her Heating & Cooling maintenance service of choice. our Appointment Center team member Bailey set up a call for Kelly to visit her home to give her a proper diagnostic and recommendation for improvements. The best choice that fit the customers needs and budget was the GSM TruComfort Signature Series 96% Efficient heating unit paired with the GSM TruComfort Signature Series air conditioning 14 SEER unit. We also provided the customer with new properly functioning low level CO monitor and a new Honeywell programmable thermostat. This choice was the best fit for the customers home to improve their comfort, efficiency, lower energy costs. The Corbin's were in need of a new system and we wanted to do our best to ensure that the customer will be happy for many years to come. We recently installed a complete new heating and air conditioning system for this customer in Gastonia. The system consisted of new GSM TruComfort Series furnace in the crawlspce of the home and a new a/c and coil outdoor unit for the air conditioning system. Now the customer will be comfortable in their home with their completely new hvac system. Leave to Comfort to Us! Our Residential Install Division conducted a soldering training this morning to ensure everyone provides the highest quality work possible. There are many who settle for doing less, or enough to pass code, at GSM Services, we provide the highest level of training to ensure that our teams continue to be the leaders in our industries. GSM Services provides an environment where our co-works can succeed. Help Make your House More comfortable and Effecient! On this job we completed our traditional air seal and insulate of the attic and air sealed the crawlspace as well. 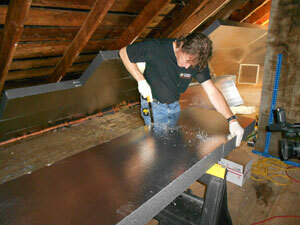 We installed SilverGlo to the attic-adjacent wall and sealed off the cavity as well. Super deck install to provide a storage platform in the attic. Duct Encapsulation with spray foam to keep everything sealed and air tight. Finally, we installed the stair hatch cover which keeps the air consistent ensures no loss. We have quite the honor to present to our very own, Scott Konowinski! A customer called GSM Services to take a look at where bees are getting into the attic and see if we could spray foam the area to seal off the home. What’s more, the customer was on a HUGE time crunch for a graduation party being held at their home. We had a Comfort Advisor go to the home to check out the situation and found out that the bees have been developing a giant hive behind the siding. The homeowner wanted to remove the bees in a humane way so reached out to a bee-keeper, but that didn’t stop us from helping the customer. GSM Services RoofShield division came into the situation to help, this is where Scott Konowinski “bee-came” a GSM Super Hero. We had various GSM co-workers involved in this job but Scott stepped up and volunteered to help remove the bees by climbing up on the roof in a bee suit. After removing the siding, they found over 200 POUNDS of honey combs between the siding and the wall of the home. Realizing that this was not a heating and cooling, home energy solution problem or even a roofing matter, our employees didn’t stop at their hired responsibilities. This is a perfect example how GSM’s core values. Core Value #3: Exceed customer's expectations in everything we do. We are proud of the work that Scott provided so this SUPERHERO award goes to you! Furnace not coming on to heat the house. The furnace is an older unit and has had to have the circuit board replaced before. The thermostat is a new one and has fresh batteries. My heat is not working. The panel is on and saying auxiliary heat is on but nothing is coming out of vents. My heat isn't working and we need someone out quick! Times when the heat is slow to warm house. Our entire camp property is on a well. The well pump is 3 phase and last Summer we had several power outages that left us with no water (we had around 350 people staying at our camp each week). Needless to say we need a solution to this problem. Wanting to replace our ac/gas heat unit. She's up in years and we want to beat her to the punch before she dies on us. Looking to get it done ASAP and would love to set up a quote on what that may be. Air intake vent smells like old sweaty socks.